The development of Critical Realism (CR), as a philosophy of science, is generally attributed to a series of books by Roy Bhaskar. It has proven to be influential, not least because it has an affinity with many people's views about the way the world fits together, both within and outside of academia. Whilst there are numerous contributions outlining CR theory in sociological and organizational research, as well as general texts about realist ontology, workdelineating the consequences of these views for research practice is an emerging area of interest. This book aims to fill a significant gap in the literature by providing a practical guide to the application of CR in empirical research projects. More specifically, it explores the methodological consequences of committing to a CR ontology-the assumptions that researchers from this tradition make about the nature of reality. These assumptions are important because ontological commitments, which relate what we believe exists, often affect our epistemological concerns, which relate to ourbeliefs about how whatever exists can be studied and known. Thus, for a researcher, ontology and epistemology are important because they have consequences for the possibilities and limits of the research methods, techniques, and analyses that they employ. 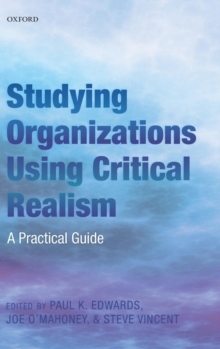 The book explains what CR is and outlines the logic of research design. In a series of chapters on major social science research methods, purpose-written by experts in the relevant technique, the book contains extended illustration of how to conduct inquiry using CR.